Our birth was fully public health care, save for one aspect. Inconvenient timing meant our 12-week scan would be late, due to Christmas, so we paid to have a scan at 11 weeks instead. The scan was done in one of the numerous private clinics on Harley Street. Subsequently I visit another clinic, for physiotherapy after a ruptured achilles tendon suffered playing football. Earlier, chest x-rays for my Australian visa had been conducted in another clinic, a block east. A full physical for the visa was conducted in yet another clinic just south, including an embarrassed cough into a doctor's cupped hand, eye tests, blood tests and what felt like a curious form of jujitsu to test reflexes and coordination. I could begin to plot a map of my dismembered body across the 5 or 6 streets that bound this area. All these spaces, including the private clinic we first see Oliver in, are based in what were once beautiful Georgian residences. Sadly, they've been sliced around with rather less care than the surgery they're home to, and many of the rooms are peculiar, uncomfortable spaces as a result. Staircases are chopped in half; floors inserted awkwardly; rooms carved out of the body of the building. The x-rays are performed down a weird staircase into a basement; the physiotherapy in a couple of oddly-shaped rooms, one with massage table pressed up against dormant fireplace; another which is obviously half the original room, cheap stud walls demarcating one financial arrangement from another. The streets themselves are of the broad eighteenth century variety, made to the width of a few horse-drawn carriages, with most buildings having steps up, and a basement level down below. 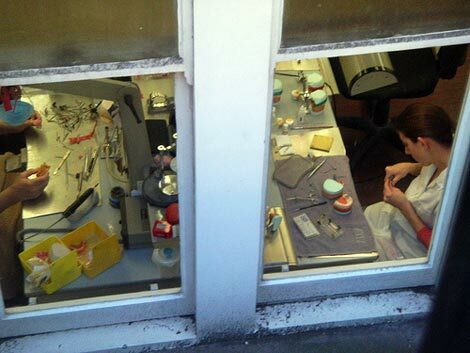 Above one such downstairs office, I stood and watched people fabricating teeth. Friends who lived in the area report of fabulously wealthy middle eastern women departing clinics in the very early morning, with elaborate surgery delicately concealed under burqa. It's been associated with medical practice for so long that the place name has become more of a sign for this work than a street-sign. 'Harley Street' can actually be used to refer to several blocks of streets around the real Harley Street, each dotted with clinics containing an 1500-strong army of medical practitioners, ready to pounce on everything from hair loss to occupational health to, well, baby scans and achilles tendons. The street was named after Edward Harley, who is actually responsible for laying out most of the area, after inheriting it from his wife. But most of the area is now owned by the De Walden estate, whose signs you can see everywhere, if you look carefully. The De Waldon peerage goes back to 1597, apparently in exchange for one of them doing alright in the battle with the Spanish Armada. De Walden is one of the large London estates, dominating this side of central London, just as most of the later entries in this series are on land owned by the Bedford Estate. It isn't obvious to the casual observer but most of central London's land is owned by just a handful of estate owners (the other big landowners are more ultility-based, like the rail companies). In terms of urban development, opinion varies wildly on whether these traditional estate owners are an effective way of stewarding urban space. At an NLA exhibition a while back, the case was made firmly in favour of the estates' enlightened husbandry [PDF here], though it was sponsored by the estates themselves. The De Waldon Estate effectively curates the area, only accepting tenants which it feels are appropriate in some undefined way. The idea of carefully curating an area, as well as being open to emergent development, seems a good idea in principle and should be done more often. But it can go horribly wrong in practice. Trades like psychologists and osteopaths were treated with real suspicion and only really allowed into the area after World War 2. Worse, a recent decision to ban abortion clinics from the area seems misguided, particularly to align that with cosmetic surgery. Still, they own the land, and in London, a city essentially defined by money and property - and money for property - that's what happens. The fact remains that central London is defined by this almost-feudal model of property ownership - always has been, and always will be. It's unclear how Harley Street developed into an area defined by medicine. It appears to be a classic case of an agglomeration economy, simple as that. In 1860, there were 20 doctors registered there, no doubt attracted by the fine residences, and it's simply grown since then. 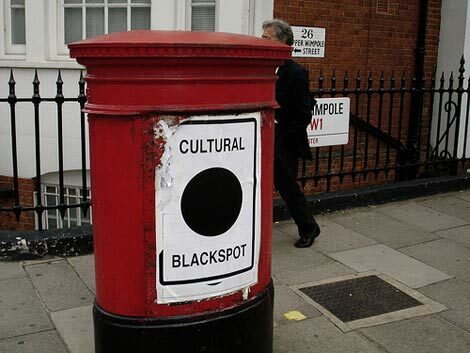 Will Self's acid is sprayed liberally over Harley Street in one of his 'Independent' pyschogeography pieces, noting the fervent desire for an actual Harley Street address - and how the street's space is warped, accordingly. "Between (Dr) X's establishment on Lower Wimpole Street - The London Hospital for the Medievally Ill - and the corner of Harley Street itself, I passed Numbers 117, 117a, b, c, d, e, f ... through z. So intense is the desire of quacks to obtain premises in the grid of streets between Portland Place and Marylebone High Street that some unscrupulous cosmetic surgeons have been known to tunnel in from as far afield as Hounslow. Obese dowagers are then strapped to motorised trolleys and powered through the underbelly of London to where they can have the fat sucked out of them for vastly inflated prices, purely on the basis that they're "in" Harley Street." I seem to recall that one of those early doctors in the area was Sir William Withey Gull, whose surgery was hereabouts, and who was implicated by Alan Moore in 'From Hell' as Jack the Ripper. He resided a few streets south in Brook Street however, an area south of Oxford Street that continues the urban form, though now highly commercialised, full of galleries, shops, cafés. In contrast, there's a curious feel to the Harley Street area, as it's essentially residential/surgery/small office space, with no such shops, amenities or other functional space. Sandwiched between Oxford Street and Marylebone High Street, there are numerous attractions a few minutes away, but it's an area perhaps overly defined by one function. Just block after block of gorgeously articulated Georgian architecture, mostly offering up its haughty, impenetrable grandeur. Unless you have an ailment and some money. Or you need a scan and can't wait a few weeks. And so it's here, in the undistinguished interiors of distinguished addresses, upstairs in an eastern European consultant's untidy little office, that we first see Oliver Kornel Hill wriggling away on an LCD monitor.